Documents in NET.Notes are displayed in the views, which are basic pillars of the system. To find proper information is not always easy in milions of documents, so dat filtering has to be easy as well as efficient. In NET.Notesu we are using for this Elasticsearch. This allows us to use very sofisticated method of searching. a) Filering by number range – if documents contains some numbers, like revenue, number of users etc. you can use those information for searching. For example if we want to see all companies with revenue higher then 100k, we can filter them using our special filter. b) ‘Drill-Down’ views – this type of view allows us to drill-down into the data deeper and deeper. 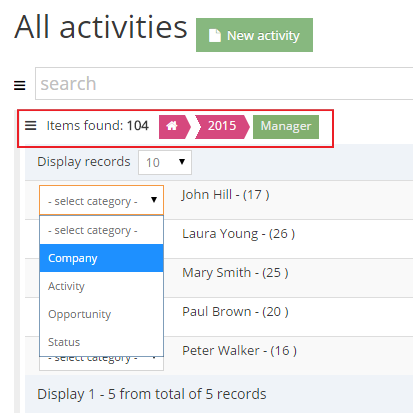 For example, in Activities you select year ‘2015’, then select category By Manager, then ‘Laura Young’ and you can continue to see her activities By Company. Or you can start By Company at the top and then drill-down using different categories. Everything is up to you, the important thing is to get the data according your needs.